Medication trays – a.k.a. med trays, code trays/kits/boxes/bags, transport trays/kits/boxes/bags, intubation kits, C-section trays, anesthesia trays, and so on ad infinitum – are common in acute care pharmacies. I’ve seen them in every variation you can imagine in every pharmacy I’ve ever been in. Depending on the situation, med trays can contain a large number of injectable medications. For example: code trays may contain several different neuromuscular blockers like vecuronium, rocuronium, succinylcholine; pressors like epinephrine, norepinephrine, phenylephrine; other code drugs like atropine, vasopressin; reversal agents like naloxone and neostigmine; antibiotics, etc, while a C-section tray may contain local anesthetics in various shapes and sizes (lidocaine with or without EPI, SDV or MDV, bupivacaine of various concentrations, etc). The list goes on. It’s pretty crazy. Busy hospitals may have more than a hundred trays floating around the facility at any given time with another 30-50 sitting in the pharmacy waiting to be filled by a technician, checked by a pharmacist, or in need of delivery; of course the number of trays will be smaller for smaller facilities. In hospitals with busy Emergency Departments and/or busy OR’s that use anesthesia trays, the turnover rate is rather impressive. Use…fill…check…deliver, done repeatedly throughout the day. Recently I’ve had more than ample time to reflect on the process – read that as I’ve recently had to check a lot of med trays. Spending all that time looking at med trays has given me time to think a little more deeply about the process. Med trays are prone to error. It’s a manual process and everyone is always in a hurry. (2) I’ve found my fair share of errors while checking trays. The most common type of error is omission of a drug, either failure to fill and empty slot or failure to bring the quantity up to the required par. Another type of error I see is when something has been used, placed back in the tray by the physician or nurse, and not replaced by the technician. In other words I find a partial vial in the tray. I also occasionally find the wrong drug in the tray. It’s rare, but it happens. I almost never find drugs mixed up in pockets, or placed in the wrong pocket. I find this interesting. One has to wonder why pharmacies continue to use such an antiquated process. If you must use med trays, there are bar-code scanning and RFID-enabled tray management systems on the market. I recommend you get one. Which one is up to you. Med trays are dirty. Does anyone besides me wonder if these things pose an infection risk? Think about how many times an anesthesia tray gets used over the course of its lifetime. As much trouble as we go through in the IV room to prevent contamination, one would think we’d do something to ensure the sterility of med trays. Wipe them down with alcohol? Blast them with UV light? Something. These things are being used in ORs where everything is supposed to be sterile. Many years ago a colleague and I wanted to do a study on anesthesia trays. We proposed performing swab tests on the trays when they were returned to pharmacy for replenishment. We were trying to be covert about it, but the pharmacy manager and infection control department got wind of what we were doing and shut us down. They didn’t want to know. No regulatory body required it so they wanted nothing to do with it. I tried to convince them that it could be publishable, but they didn’t want to hear it. Tray color matters. I know this sounds weird, but dark colored trays make it more difficult to read the labels on the vials. I hadn’t noticed the problem until recently. I had been checking trays that were dark blue, and then I came across a yellow tray. Man, what a difference. Maybe it’s my aging eyes, but something to think about. 1. There were times during my career when I checked 20-40 trays a day for long stretches, so it’s not hard to imagine that I averaged more than 20 trays a week for the better part of 10 years. 2. To properly check a med tray, a pharmacist needs to verify that the drug is correct, in tact, and in the right location; that the drug is not expired; and that it has all the required auxiliary labels to meet the never ending onslaught of regulatory requirements. When done correctly, each tray takes approximately 3-5 minutes to check. Assuming 40 trays at 5 minutes each, a pharmacist would need to spend more than 3 hours of their 10 hour shift doing nothing but checking med trays. Not likely. A more likely scenario, of which I’m guilty of, is giving the tray a quick once over. How many errors have I missed over the course of my career? Too many to count, I’m sure. (6) Dirty trays – Aggravated ??? – Scanning technology is better at some things, but not all things. 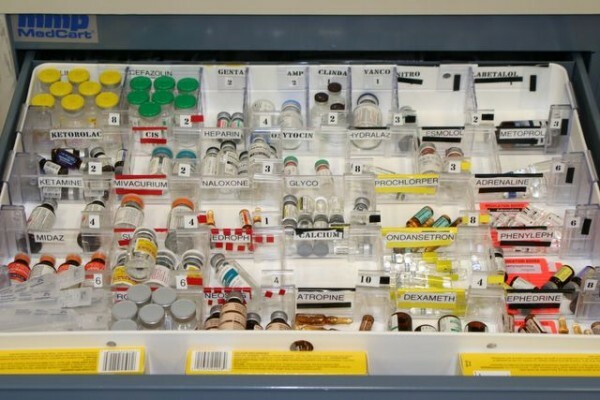 The manual checking process involving a technician and a pharmacist would be capable of detecting all five (1-5) of the potential medication tray issues. The reason for this is because if done properly each item in the tray has to be manually inspected to detect any wrong drug or drug expiration issues. – The ability to detect a partially used vial may not be as good, especially with RFID-based technology because there is no need to “touch” any item in the tray. If the technician does not do a careful visual inspection of the tray, partially used vials may be overlooked. At least with a barcode-based checking solution, the technician performing the check will have to pick up and scan each item in the tray. – If dirty trays are an issue that is not being addressed, placing all trays in a single location for the RFID scanning process (i.e., the RFID detection box) could possibly lead to cross contamination from one tray to another. I have two big takeaways from your post: (1) Hospitals using scanning technology (particularly RFID-based) should not neglect the need to carefully perform a manual inspection of each tray in order to detect partially used vials and items in the wrong location, and (2) Consideration should be given to decontaminating trays after use, particularly if there are issues identified during the manual tray inspection process. The bottom line is that new technology is not going to solve all of the problems and, in fact, new problems may be created. Careful human inspection is still required. I also hope that someone will be motivated to investigate the issue of “dirty trays” and the need for routine decontamination (e.g., resident project). You make some great points, Ray. Love the way you break it down. I think you analysis is spot on. I agree that the use of technology should not take the place of a set of eyes on the tray, at least until we can find a way to account for partial vials with technology. Hmm, decontamination….that would make a good residency project. The problem I find with today’s residents is that they think any type of project involving operations is “beneath them”. It seems that only clinical activities make the cut these days, and that’s real shame. What I wouldn’t give to see the “generalists” role become popular again. Thanks for stopping by. Always appreciate your feedback. Reading this took me right back to my overnight shifts at the hospitals. Perhaps if the pharmacy were to purchase more trays, and when accepting returned trays, transfer each vial to a freshly cleaned tray, wiping down along the way? then when the crash carts return from central sterile processing, They could swap them out somehow that way. That’s a good thought, Annie. I don’t know what the solution should be. Everything I come up with would require a lot of extra work. Extra work; Is that what decides whether or not a pharmacy does that right thing? Unfortunately, that’s sad, but true. If one patient dies because of an infection secondary to exposure to a contaminated drug tray, would that justify some form of decontamination? Or, if a few patients require a few extra hospital days for additional treatment because of contaminated drug tray? The fact is that we don’t know the significance of the problem. Jerry, as you suggested earlier, someone needs to study whether recycling drug trays poses any significant risks. Then, knowing the risks, if any, we can determine what needs to be done to minimize any risk. If pharmacy doesn’t do this type of study, maybe someone should bring this to the attention of the Infection Control department. I suppose I should clarify my comment about extra work. Doing the right thing is always best, but you know as well I do that pharmacies don’t make decision like this because “it’s the right thing to do”. Pharmacies make changes for one of two reasons: 1) it required by regulation and/or law, 2) they think it will make them “more clinical”. At least that’s my experience. I rarely, if ever, see changes made for other reasons. Not to say that it doesn’t happen, just that I haven’t seen it often during my career. Yes, it should be studied. Remember what I said in my post? I tried to look at this many years ago and was shut down by our operations manager and our hospital’s infection control. Our manager didn’t want to create more work, and infection control didn’t want to deal with the headache should we find something scary growing in the trays. Do you know a research-friendly facility that would be willing to tackle a project like this? If so I’d be happy to speak with them. Seems like something well suited for an academic medical center, especially one connected to a school of pharmacy. Hey Carlos! Nice to hear from you. Hope all is well.